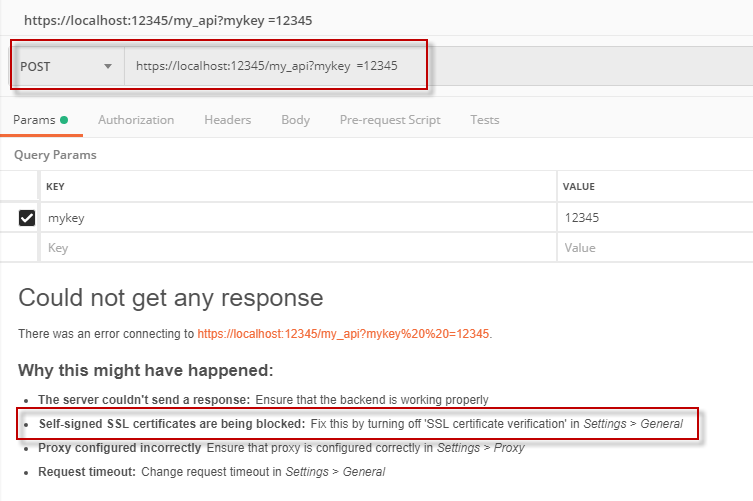 After having Chrome refusing to accept self signed certificates when testing in localhost a web application, following advice from here, here and here I have set up a local Certification Authority and created SSL certificates with Subject Alternative Names. Now I can run the web application in https://localhost and have a green secure icon in the url bar in both Firefox and Chrome. The problem now is that the application makes API calls to https://localhost:8010. While Firefox handles these requests, Chrome is rejecting them with ERR_SSL_PROTOCOL_ERROR. Just to test I have put a test.html file in the API endpoint so I can make a normal HTTP request and see what happens. In Firefox I get for both pages https://localhost:8000 (the web app) and https://localhost:8010/test.html (the API endpoint) a green lock in the url bar. The certificate is correct and the connection is encrypted using TLS 1.2 in both requests. Doing the same in Chrome fails for the API endpoint. The Security Tab of Developer Tools reveals a Certificate Valid and Trusted but it does not have the Connection Secure with TLS 1.2 indication. See the screenshots below. I don't know where to look for the error so, how can I debug what is happening in Chrome? as expected. So to access it I'm trying to add trusted certificates to the server, as per the instructions here. I put this directive in proxy.conf and it points to a file that includes the server's certificate, but this has no effect. I restarted the server (sudo service apache2 restart), and did some sanity checks to make sure I'm chaning the correct file. What am I doing wrong? I have a domain with a LetsEncrypt certificate installed and apache conf setup to forward www to non-www and non-ssl to ssl. Everything was working great until I decided to add a subdomain and tried to generate a new certificate to cover both. Your cert will expire on 2019-07-19. To obtain a new or tweaked version of this certificate in the future, simply run certbot again with the "certonly" option. To non-interactively renew *all* of your certificates, run "certbot renew"
- Some rewrite rules copied from /etc/apache2/sites-enabled/000-default.conf were disabled in the vhost for your HTTPS site located at /etc/apache2/sites-enabled/000-default-le-ssl.conf because they have the potential to create redirection loops. I am trying to configure Azure application gateway WAF with a backendpool set to a VM in a different Azure tenant using its public IP address on port 443. All the SSL certificates are configured properly. However, I keep getting following error while browsing the site via WAF. I have confirmed that NSG is on the mentioned backend VM is allowing all traffic on port 443. What could be going wrong here? Do you have any idea of how to make it work when it is shared with ngrok ? I have a Laravel 5.8 project running on XAMPP. Everything works fine on localhost (mywebsite.io for dev) but when I go to localhost:7881 (mywebsite.io:7881) it also works but when trying to access the logged in user, Auth:user(), it returns null. I'm using the 7881 port because of Prepros for live reloading. At first it was being blocked because of CORS. I fixed that by using "Access-Control-Allow-Origin" but now i'm having this issue. Most parts of the website works after the CORS fix but now Auth:user() returns null.